The Restaurant Theme features an elegant design and layout perfectly suited for restaurants, cafe’s, coffee and tea shops or other businesses within the food related industry. The background and theme colors can easily be changed within the options to match your brand, and give the theme a completely different appearance. 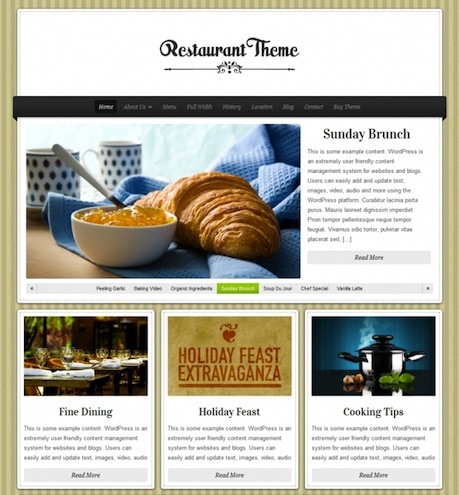 The Restaurant Theme features a food and drink menu template, making it easy to add and display your menu items. In addition, the theme includes multiple homepage layout options, an RSS subscribe widget and a variety of other great theme options.